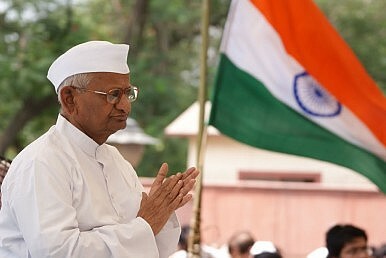 Supporters of activist Anna Hazare call for a probe into alleged corruption among the premier and his cabinet. Team Anna is getting ambitious. The motley crew of an aging social activist and his supporters are now targeting Prime Minister Manmohan Singh in a corruption case for the first time since the group launched a people’s movement against the United Progressive Alliance (UPA) government in April 2011. Team Anna launched a frontal assault on the UPA government on Saturday, leveling serious corruption charges against Singh and 14 of his top ministers, four of them from the Congress-ruled Maharashtra, the financial hub of India – Sharad Pawar, Vilasrao Deshmukh, Sushil Kumar Shinde and Praful Patel. Team Anna has prepared a 79-page dossier, largely based on reports of the Comptroller and Auditor General (CAG), and has written to the prime minister demanding that a special investigation team be set up to probe the graft charges. The group has even named six judges it believes should conduct the probe. Prashant Bhushan said at a press conference in New Delhi that he has already written to Singh requesting a special investigative team probe the corruption charges against himself and 14 of his ministers. “The CAG report on the coal scam is the basis for alleging corruption; the prime minister was the coal minister between 2006 and 2009. Then coal blocks were given away at throw away prices. There were repeated efforts by the coal secretary to suggest that auctioning was the best way out,” Bhushan reportedly said. The other ministers targeted are: P. Chidambaram, Pranab Mukherjee, S.M. Krishna, Kamal Nath, Virbhadra Singh, Kapil Sibal, Salman Khurshid, G.K. Vasan, Farooq Abdullah and M.K. Alagiri. While Team Anna has accused the prime minister of corruption in the alleged coal scam, Pranab Mukherjee has been accused of corrupt practices over the Scorpene submarine deal during his stint as defense minister, while Chidambaram has been accused of involvement in five corruption cases, including the 2G scam and the Vodafone clearance row. — Manmohan Singh’s interventions as in-charge of the coal ministry: 24 blocks were allocated in 2005, 53 in 2006, 52 in 2007, 24 in 2008 and 16 in 2009. Interestingly, only one coal block was allocated in 2010, and not even one in 2011. — Under his watch, a major coal allocation scam took place which allowed private firms to make windfall gains, as is clear from the facts that are now out in the public domain and the report of the CAG. The average allotment of coal blocks was 3 to 4 per year until a few years back. But this number shot up drastically to 22-24 during 2006-09 when Singh was in charge, raising questions about the manner in which these allotments were made. — All the allotments were made without transparency, without protecting the interest of public exchequer, and without any competitive process. The ruling Congress party has unsurprisingly rubbished these accusations as “unsubstantiated averments” that need not be responded to. Regardless, the development has made the battle lines clear and may force the UPA government to launch a full-scale crackdown on Team Anna sooner, rather than later.